Stunning Audi A5 S Line. One former owner with Audi main agent service history. 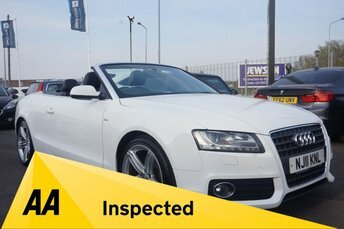 This Audi has been independently inspected by the AA for your added peace of mind. We have uploaded a full Hd walkaround video to show the quality both inside and out of this high specification S Line Audi. Low rate, 0% deposit finance available. Please ask for a personal quote. Comes with all documentation, Stamped service book, owners handbooks, both keys, full clear Gold HPI Report, AA History Check Report, AA 128 point Inspection Report. 12 months complimentary AA Breakdown Cover. Please call or message if you require further information or to make an arrangement to view. Peter Scott Cars is a family run business with over 30 years of experience sourcing and supplying quality vehicles. From the flowing lines of the coupé to the open-top fun of the cabriolet, Audi's A5 range can delight and thrill with ease. The quality interior is typical of Audi and the A5's standard kit makes this model exceptionally easy to live with. Turn to a used A5 Sportback if you require the practicality of a five-door vehicle, or give in to the additional power and performance that's on offer with the S5 models. 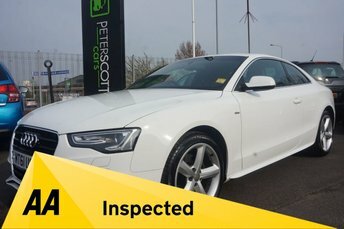 You'll find a great selection of used Audi A5 cars for sale in Widnes right here at Peter Scott Cars. View our range online before contacting a member of the showroom team to discuss your requirements in more detail.